Team CSF is a community of individuals actively fundraising in support of the Children’s Scholarship Fund (CSF). 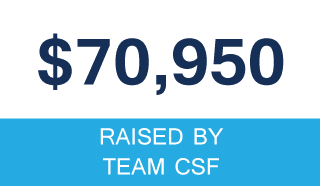 Whether developing an independent campaign or joining an event organized by CSF, team members are united in the shared goal of building awareness about CSF while raising funds so that more low-income children can benefit from a CSF scholarship. This school year, CSF is helping almost 24,000 children throughout the country, including more than 7,500 in New York. Even so, the demand from families far outpaces funding and many are turned away each year. CSF has earned accolades as a top nonprofit from Charity Navigator, Independent Charities of America (ICA), and GreatNonprofits. In fact, ICA’s “Best in America” Seal of Excellence is awarded to fewer than 5 percent of U.S. charities. 100 percent of every donation goes directly to CSF scholarships and the children and families CSF serves. The average CSF scholarship amount is approximately $2,000 in New York. So $2,000 not only funds a full year in school for a low-income child but also forever changes his or her life by opening doors to new opportunities and a better future. Be a part of the change by joining Team CSF! To participate in events organized by CSF, please check the Team CSF event page for updates. Or, if you have an idea for your own fundraising event or one for the team, please share with us! To understand the full impact of your efforts, please click here. Together, we can help more children benefit from a CSF scholarship! For general inquiries about Team CSF, please contact Michele Mitola at (212) 515-7108 or mmitola@scholarshipfund.org.